The CRA has issued a news release for those people affected by the recent fires in Alberta. I called the CRA this afternoon to get a bit more information for one of my customers who has lost her home in Fort McMurray. I found out that the CRA has set up a Fort McMurray help line. Call the general phone line at 800-959-8281 (individuals) or 800-959-8281 (businesses) and ask to be transferred. The Fort McMurray help line is located in Calgary and currently open 8-6pm MST. If you are affected by the fires and unable to file or pay your taxes on time, you can request taxpayer relief. You can submit your request by filing form RC4288. Who should file this form? Individuals or businesses affected by the fires who are unable to file or pay their taxes on time. This includes sales tax and payroll tax. Complete one form per taxpayer/business. When should I file this form? As soon as you get any notices with penalties and/or interest. If you haven’t filed your tax return yet, wait until you do so. Don’t file the form until/unless there are penalties and/or interest to waive. How should I file this form? Mail your form to the Winnipeg Tax Centre. The address can be found on the bottom of the form. You can also submit the form online using the CRA My Business Account or My Account for Individuals if you have it set up. Anyone you have added as a representative (your accountant or bookkeeper for example) can also submit this form online. As of right now, requests are not being taking over the phone, but this could change. What address should I use? Use any address where you’re currently getting mail. This does not have to match what the CRA has on file, it’s simply a mailing address. What about section 3 – Supporting documentation? The form mentions a police/fire report and insurance statements. I was told that as of right now, the CRA doesn’t have a whole lot of information on what exactly will be required if you’re filing for relief. Call before filing to find out what is required. This is the information I have as of today. I’m sure that the CRA is busy sorting out the particulars and getting agents up to speed on processes. Again, if you have any questions at all, please call the help line. They are very helpful. My heart goes out to all of those affected by the fire. 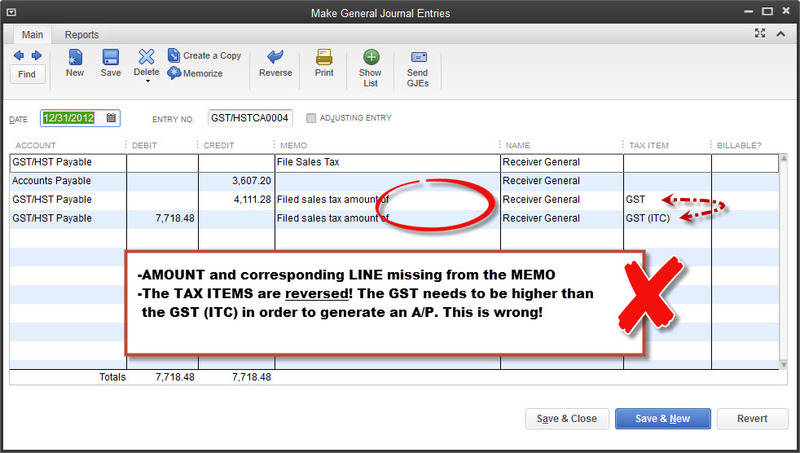 Why is my previous QuickBooks GST/HST ‘File Sales Tax’ journal entry incorrect? 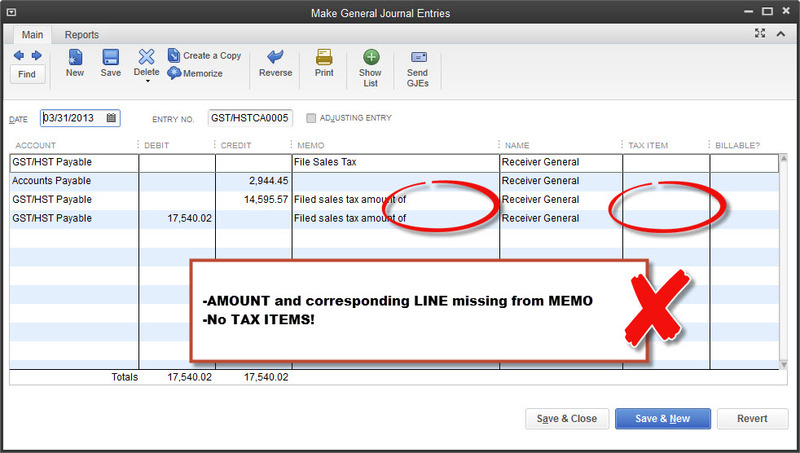 ISSUE: the journal entry that QuickBooks automatically creates when filing sales tax is not entered correctly. The most common problem is missing tax items. You may also see missing information on the memo line, and you may even see the tax items switched around. This is a known issue. QuickBooks senior tech support tells me it’s essentially random. It started with the 2012 R12 update and the 2013 R4 update. It’s considered a critical issue with moderate severity and high impact. The engineers are working on completely removing this issue. SOLUTION: Go back to the incorrect journal entries that QuickBooks created and manually correct them. Review previous, current, and future tax filings carefully. 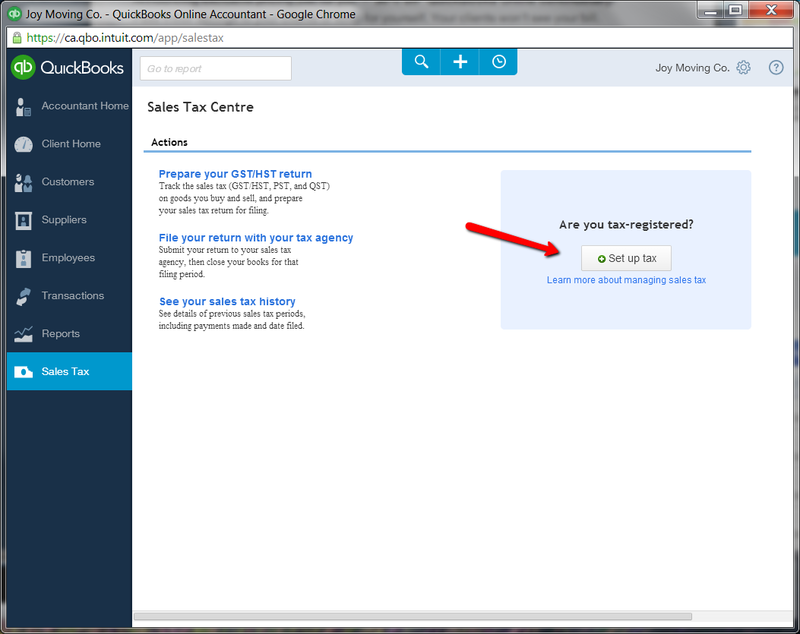 My advice until Intuit works on eliminating this potential problem is to keep current with your updates and CHECK YOUR ‘FILE SALE TAX’ WINDOW CAREFULLY BEFORE FILING! Watch out for unassigned tax amounts. If you have any, drill down on the amount. If you end up in a previous ‘File Sales Tax’ journal entry, and you spot something wrong, you’ve likely encountered the ‘File Sales Tax’ bug! 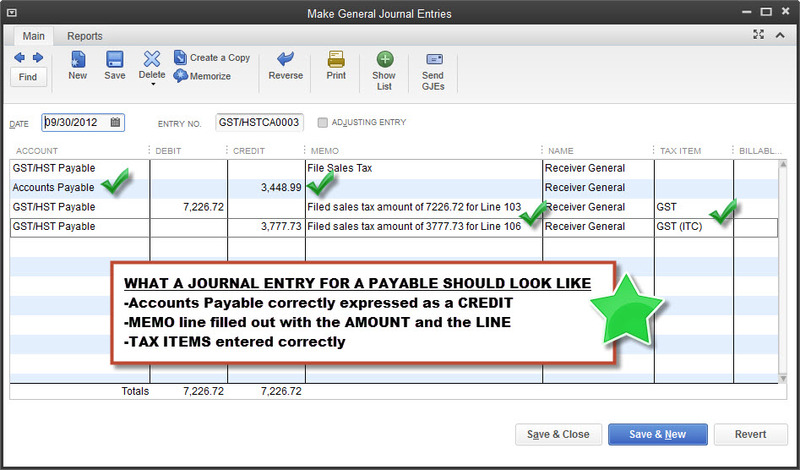 You will need to correct the journal entry by entering the correct tax items. If you discover information missing from the memo line, correct that as well. You can refer to previous filings for missing information. NOTE: these errors carry over to the next sales tax return. If you discover more than just the last “File Sales Tax’ journal entry incorrect, your previous filings with the CRA could have errors. Other tips for spotting errors in the File Sales Tax window: Manually multiply line 101 by the tax rate in your province for a ballpark figure of what line 103 should be. Drill down on line 103. Look for a balance leading into the period. This will be zero if you have not made changes to your sales after your last filing. Drill down on line 106. Again, look for a balance leading into the quarter. This will also be zero if you haven’t made any changes to your purchases after your last filing. Be careful when troubleshooting your sales tax, and always make a backup of your file before making any changes. I’d love to hear from you if you’ve run into this particular bug! Didn’t receive a T4 or other T-slip? YOU could be the one penalized! Still waiting for a T4? There’s more reason to be concerned than simply not knowing the exact numbers. Read this excellent article, courtesy of CBC news. Did you get a notice from the CRA that you’ve received a Hiring Credit? If you haven’t already figured this out, here’s an easy way to do it if you’re using QuickBooks Payroll. The credit can be recognized as either Income or a reduction in your EI Expense account. I’m going to explain how to recognize it as an Expense. Create your current Payroll Liability cheque as usual by selecting the Pay Payroll Liabilities window and choosing your date range. Fill out as you normally would, selecting “review liability cheque to enter expenses/penalties.” Click create. But don’t close the cheque just yet! In the detail section of the cheque, choose the EXPENSE tab. In the account drop down menu, choose the account you use to track your Company EI expense – this would be “Payroll Expenses” if you accepted the QB default accounts when you set up payroll. Enter the amount of the credit as a NEGATIVE number. Enter a memo to note the reason for the credit. Then click “recalculate,” select save and close, and you’re done!